If we were meeting for coffee this weekend, I’d order pain du chocolat to go with my coffee. Would you like one, too? I like my coffee black and piping hot, and I bite off the corner of the pastry then dip the exposed chocolate in my coffee to melt it on the edges. I usually end up dribbling coffee and melted chocolate, along with pastry crumbs, down the front of my shirt. But remember, I have a clean one just like it to change into. While sipping my coffee – which is rapidly cooling – I’d repeat how much I prefer almost-burn-your-tongue-hot coffee and how I hate going to restaurants for breakfast where the server places a plastic carafe of coffee on the table. Coffee which is barely lukewarm to begin with, and cool by the time it hits my cup is not the outta-bed jolt I’m looking for. I’d tell you that Raqi is beyond herself with grief and excitement as she learns first-hand about the cycle of life. She and Sparks just lost their dear dog Kaleb Spencer (yes, our family dogs have middle names) to old age. Sparks bravely accompanied his Dad to the vet’s after they made the difficult family decision to end Kaleb’s pain and suffering. A week later little Briar Rose, their new Shorkie pup, arrived on their doorstep. Plus, Raqi’s third grade class is currently incubating a whole slew of chicks – well, right now they’re eggs, but some will become chicks if we’re lucky. And there is nothing like baby chicks to make me think about Easter and spring being right around the corner! 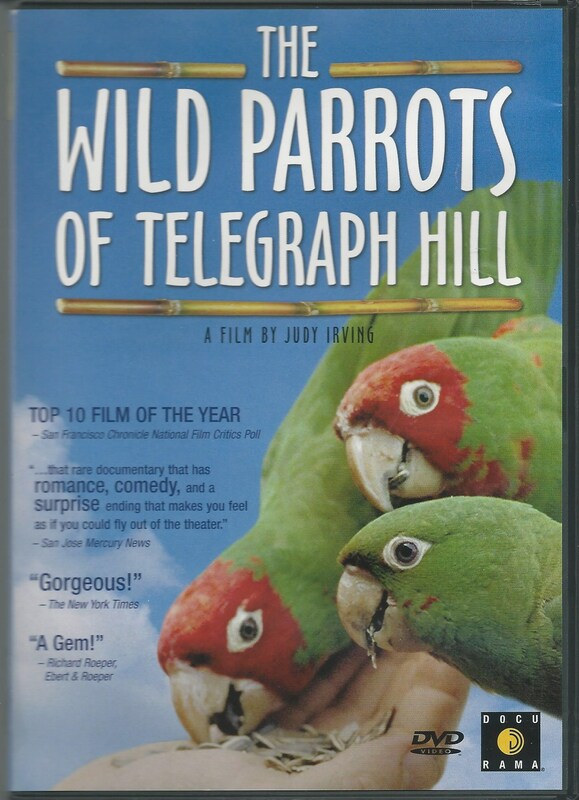 If we were meeting for coffee, I would tell you about this little gem of a movie called The Wild Parrots of Telegraph Hill, and I’d hand you the DVD and urge you to watch it. It’s a documentary about Mark Bittner – a gentle, unassuming ‘bohemian’ who lives in an unadorned one-room structure on the side of a very steep hill in San Francisco. There is a flock of parrots – escaped or let loose by owners – for whom Mark has become the unofficial caretaker. They forage ‘wild’ on the hill, and Mark records his observations as well as feeding and nursing them when they are wounded or ill. He has named them, and tracked their behavior, mating rituals and personalities for years. The parrots are vibrantly colored, charming, scheming, cooperative, combative, blustery, vulnerable, and have a mutual love for Mark. I cry every time I watch this touching relationship that stretches the definition of ‘family’. In one moving dialogue with the filmmaker, Mark likens our life cycle to the movement of a waterfall. He says before birth, we’re all part of the stream above the falls – moving en masse and indistinguishable. Once we reach and plunge over the falls – during the turbulent tumble (life) – we each travel as a single, unique drop of water experiencing our own pace, our own path. We drops come together, we separate, we spin and dance to our own tune. At the bottom, we all become one again, in the same way death dissolves us. If you love San Francisco, parrots with personality, watching a loving caretaker tend his flock, or living the ‘simple’ life we all say we yearn, you will enjoy meeting Mark. I forgot to find out if he likes coffee. PostScript: At the end of this 2005 documentary (available at Amazon), Mark reveals that the owner of Mark’s residence will be demolishing it (code requirements) and Mark will be moving. Further research indicates Mark still lives in the Bay area and the parrots still thrive on Telegraph Hill, all having moved on in their own cycles of life. If we were having coffee, I’d order what you ordered but I’d also order a glass of ice and some milk or cream to pour in my cup. I don’t like coffee that’s too hot. I like the plastic carafes full of “piping” warm coffee because that means I don’t have to get the waiter’s attention again (unless I need more cream). Losing a pet is very hard, even for an adult, especially when you have to make that decision. We’ve done it many times, but it’s never easy. It helps to know that you’re doing the right thing and that they are probably in pain that they can’t explain, but that doesn’t really make it any easier. New pets do help (unless the new pet is a nut-job Irish Setter named Maddie. Then it takes about a year before they help). I feel like I’ve been over a couple of waterfalls in my downstream journey, but it’s a nice analogy. Now I need to get some chocolate, or a pastry to go with this warm coffee in my to-go cup. Dan, I’d be willing to sip lukewarm coffee while you regale me with Maddie Moments. I’d tell you little Briar Rose already has the run of the roost although she doesn’t run, more like hops like a bunny. To mix a metaphor or two! Have a great weekend. I’m with you … make my coffee blistering hot, or don’t bother. I usually drink my morning coffee in an insulated cup to try and keep it hotter longer. Zumba didn’t work out for you? Well, then. I feel much better for never pursuing it in the first place. That’s what friends are for. Keep us away from danger! I like hot coffee too, I add hot water to my espresso for that reason, and I’m happy to share the pain au chocolate. What? There’s none left? Huh! I hope they survive! What are they going to do with them? Ah. Eggs or chicken soup? I don’t want to know. !!! If we were having coffee, I’d be sitting next to Dan…sharing the cream to pour in our coffee from the carafe left on the table. I’d probably have to (politely) ask the server to bring more cream. If we were having coffee I’d tell you that after having to put down the best dog in the world, Babe, almost two years ago…I’m getting another dog, two dogs in fact from the Great Pyrenees Rescue Organization. I pick up Z tomorrow…she’s part Labrador and Great Pyrenees. Next month I pick up Q…she’s part Border Collie and Pyre. If we were having coffee I’d tell you that I’m so excited I can hardly stand myself. You and Dan would probably move to another table because you couldn’t stand me either. That’s how excited I am…….. So exciting you are growing your brood. Losing a beloved pet is heart wrenching. We had a border collie i loved named Shad. Hopefully you will show us lovely illustrations when you have them home. How I wished we lived closer so we could have actual coffee (tea in my case) together. The intimate tone of this piece reminds me of how Anne LaMott (my new hero) writes. I will watch that documentary, and what a shame his place was demolished. I wonder if he still tends to the birds. I am sorry for your grandchildrens’ loss. My daughter, Mary is also in third grade. She also hatched chicks in class, only in kindergarten. It was amazingly sweet to see that cycle reflected in her words and expression, and it does indeed get one ready for Easter. I wish you lots of cups of piping hot, black coffee. I’d be all about that pain du chocolat, tho. I’m sorry about Kaleb Spencer, poor Raqi. I LOVE THE WILD PARROTS OF TELEGRAPH HILL!!!!!!!!!!!!!!!!!!!!!!!!!! I saw trailers for it at a theatre some time ago, shortly after it was released. I didn’t think much of it at the time, but when I saw the DVD at the library, I thought, what the heck. I’ve got two words: I’m smitten. It’s a love story in so many ways. I have watched it at least a dozen times and anyone that spends a movie night with me must watch it. Such a marvelous thing. The bonus material on the disk is also very much worth watching including a bit… well, that would be a spoiler, but let’s just say the tears were flowing copiously. Now, make room on your coffee couch, and pass the pain du chocolat. You get to control the remote (it’s your house, after all). But push play, please. I’m ready to watch it again! I’m SO tickled we’re in love with that lovely slice of life, Maggie. Now I have to watch the bonus parts 🐓🐣🐥 sorry i have no parrot emoticons!! If we were having coffee (or tea, in my case), I’d struggle to maintain eye contact with you and I’d hope my words wouldn’t come out all twisted. But I’d enjoy listening to your tales and delight in the fact you see the joy in so many things in life (other than luke warm coffee…)! I feel so happy with my blogging friends. You make life joyful. Amen! I agree it’s good to have a topic but I generally come home wailing ‘i didn’t fit’ again!!! If we were having coffee I’d be tempted to have a bite of your breakfast, but might be strong enough to resist until I lose this weight. I’d tell you I love the movie too and then I’d recount the story of how so many parrots came to be in California. A bird breeder in the 30’s in one of the canyons in Los Angeles (about this time I’d kick myself be cause I do know which canyon dangit) was threatened by one of the infamous canyon fires. He was able to move a lot of his birds but in desperation to save the rest he let them go. The climate is ripe for them and to, there are flocks of Macaws and Amazon parrots all over Los Angeles and it is believed that many made their way up the coast. They like the coastal areas better than inland areas. I would tell you about my encounter with a wild one on Barrington every morning. I’d tell you about the scare we had with Mitchell’s beloved gurl kitty last night and how th two of us stayed up to make sure she was okay (she may have had a mild stroke.) Then I’d drag you out for a bit of urban sketching! Dang I want a bunch of us to meet up! Laurel, I snapped it up from another blogger, and have seen wine or beer instead of coffee. 😆 the more the merrier! May I have a chi tea latte instead? We have wild parrots where I live also. They are wonderful! When they fly around it is a cacophony of irrational, joyful, crazy, noisy exuberance! There are all sorts of rumors about how they got started but apparently the coastal San Diego weather suits them and they are reproducing with lusty abandon! What a delightful tropical touch to a beautiful part of California! I’d be happy to share hot chocolate with you. Coffee and I don’t mix well. That’s very sad about the pet’s passing. I’m glad they have a new one to fill that place in their hearts. The movie about the parrots sounds inspiring, and I love the waterfall analogy. I’m glad the parrots are still thriving. Chicks are so cute, Jo. Full grown not so much 😊 although I guess they had a variety of both eggcolors and hatched chickens. Such fun for the 3rd graders! You would have coffee. I would have tea. You would have pain du chocolat. I would have banana bread. WE would have a lovely conversation. I, too, love my coffee hot! Even though I usually brew 2 cups for myself in the morning, I always pour a half cup at a time in a small mug and reheat it every few minutes (or an hour later, if I’m continuously interrupted by my little man). You made me think of my absolute best cup of coffee ever – Visiting friends in New Zealand, I was introduced to the magic of a french press coffee maker. My friend used dark roast coffee beans, freshly ground, and she made the darkest, thickest, most amazingly flavorful coffee I have ever had! It was a little cup of heaven. So, if we were to have coffee together, I would totally make it that way for us! Looking forward to checking out the Wild Parrots movie!! Ooh ooh I love the delicious sounding French roast coffee you had in New Zealand!! Isn’t it fun to find an unexpected memory jog? And I do the same thing – reheat my cup in microwave repeatedly! Hey! I recently saw a mug-warmer that plugs into your computer – I’m thinking you and I need this for our days spent in front of the computer writing. Although I’m wondering if it would keep the coffee hot enough to meet our standards, lol! If we were having coffee, I would be drinking tea or mountain dew (without the caps it looks more refined). Oh, the movie sounds great! Have you seen that Android commercial with the different “odd” pairs of animals playing together? I love it! Gonna add your blog to my other blogroll or whatever it’s called. I’m missing too many posts otherwise. I’ll watch for that commercial! I have been shirking my posting !! Doing taxes and fun stuff like that. Have to limit too much time hunched over the computer! Please do not use that T word. It’s killing me. Can’t even press the “like” button on that !! love your chicks! spring ready ! Yes, I’d have coffee with you, whatever you’re having. Sorry about Raqi’s dog — sad for a young child, and my goodness the stuff they do in school nowadays. I don’t remember doing that. But then again, I look at all the computerized stuff my son does in school and much as I like computes, I shake my head. What happened to cursive writing, for goodness’s sake? Anyway, a waterfall metaphor — I like it. I am going to have to sit back now and think about it. Hi Silvia – I just got online 🌼 raqi’s handwriting and spelling are atrocious for third grade. I’m appalled but don’t say anything because I know what they prioritize is different. On the one hand they do a lot to teach writing skills – narrative, poetry, etc. but the basic skills seem to have been thrown under the bus. We’ll commiserate more when we meet for coffee !! Oh, how I would love to commiserate with you. I was going to opt out of doing A to Z, but I came up with a theme that I love (Childhood Stories), so I decided to give it another go. This time I’m preparing my posts in advance though. Your stories sound fascinating; I marvel at fiction writing creativity. Will look forward to April fun reading you, Kelli amd several others giving it another go. Perhaps I should try a new coffee or pastry ever day and gain a poned a day HA. No, I’m pretty sure dunking rinses off the calories 💞 it’s midnight here so I’m headed to bed with a smile on my face from visiting with you cher Celine. LOL Sounds great!! As long as I don’t have to bake and don’t gain weight!! Yes, I have ‘conditional’ love for pastries !! 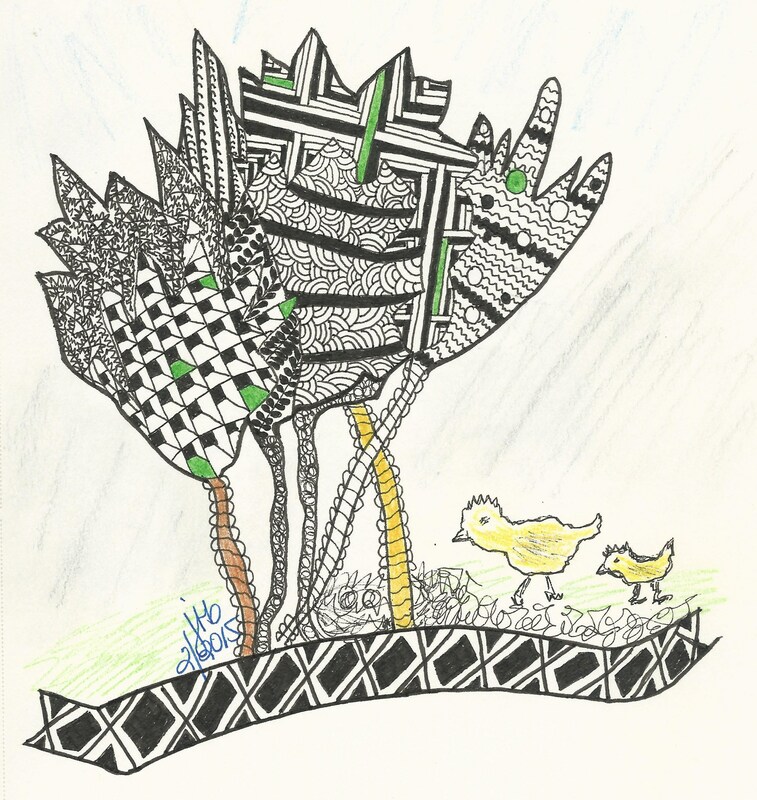 Thank you, Celine for thinking of me and sending the lovely rendition of tangles. I have just started adding colot to my tangle and like them immensgley! Yes the colour is great, but so far my favourite are those two little chicks you added. They are CUTE! Weren’t they cute? i’m glad you noticed them. It was a very spontaneous addition to my tangle. I can’t draw ANYTHING when I actually try.